What are the Different Types of Bilge Pumps? What do you do when your boat starts taking on water? Bust out buckets and rags? No, you turn on your bilge pump. This serves as an essential tool not only to remove water from inside your boat during normal conditions but more importantly, as an emergency tool in the event your boat really begins to take on water by quickly pumping it out of the boat. Bilge pumps are certainly not the most glamorous part of your boat. Though if you have any money invested in your boat, you should have a quality bilge pump and be aware of its current operational state before taking your boat onto the water. They can be a great line of defense in both saving your boat and keeping the inside free from water damage under normal conditions. During general boating use, water is inevitably going to be getting in your boat. Climbing in and out of the boat, pulling anchors, splashing waves, are all mechanisms to accumulate water in your boat. Having an electronic bilge pump easily solves this problem by quickly pumping water out of the boat bottom from the bilge pump housing, which serves as a protective box to limit debris. Every boater intends to keep their boat above water. However, accidents and emergencies can happen. Every year there are boats that capsize in even fair weather conditions. Some of these accidents could have been prevented through the use of a bilge pump or proper preventative maintenance of a dysfunctional pump. You should consider a properly functioning bilge pump as an essential, important piece of equipment to possibly prevent or limit catastrophe. Bilge pumps are effective tools at moving a lot of water in a small amount of time. They offer great convenience and peace of mind on watercraft of all types and costs. All bilge pumps are designed to move water from one place to another. However, the mechanism by which they do this is variable. Generally, bilge pumps are either centrifuge or diaphragm-based. They are all generally powered by electricity, as most modern boats are able to accommodate this. These pumps work via a spinning impeller. This spinning action carries water through the pump and out a designated outlet. They are favored for their ability to move a lot of water very quickly. They are reliable and able to handle some debris-filled water. These are the most common designs found on most modern boats. Diaphragm pumps are more akin to a shop-vac or wet-vac. They are self-priming and use suction to move water. While they do not move as much water as a similar sized centrifugal pump, they are better at moving the water long distances or uphill. Another downside is that they are more susceptible to damage and clogging from debris. Additionally, you need to consider whether you need a pump that has a manual on/off switch or automatic settings. Automatic bilge pumps will turn on and move water when a water level around the base reaches a certain level. Some pumps come with one feature or the other, while other pumps may feature both. Pairing up an automatic and manual pump together on your boat ensures convenience and safety. Having a properly working bilge pump on your boat is essential. 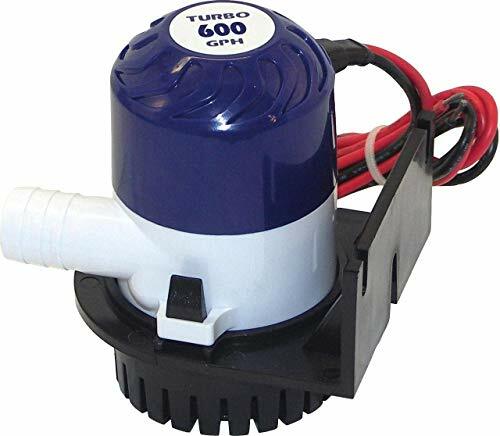 Even if you already have a bilge pump, consider upgrading to increase reliability and the amount of water it can move, generally rated in “gallons-per-hour”, abbreviated GPH. For utmost reliability on the water, a centrifugal pump is generally the preferred design in today's modern age. Now that you have a little bit of background information related to bilge pumps, we're going to take a look at some of the best ones currently on the market. Let's take a look at what makes these models stand out. 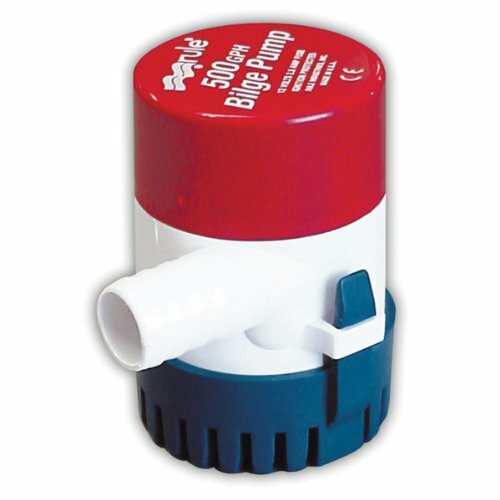 Designed for a quick and easy install, this bilge pump by Shoreline will fit a wide variety of applications. Buyers have the choice between three sizes from 600 GPH to 1100 GPH, all very common output values. Unlike other bilge pumps, this one comes complete with a mounting bracket and hardware. This makes it a near-universal fit and presents an easy install for those who may not consider themselves very handy. The marine-grade wiring ensures the durability of the electrical components in harsh, corrosive settings. This fully submersible manual pump is well-priced and presents the best value bilge pump on our list. This pump is easy to use, comes with all mounting hardware and is very affordable. The added safety of marine-grade wiring and fully submersible pump make this the best value for your money. 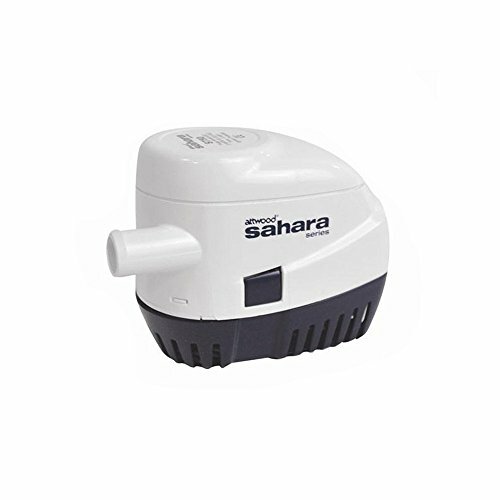 This bilge pump by Sahara is fully-contained in one convenient plastic, yet durable, housing. This lends itself well to transferring between different watercraft if necessary. This is an automatic unit that will remove water once it becomes submerged. This unit also features a convenient test switch to help make your operational checks quick and easy. The self-lubricating motor helps to ensure long-term reliability in harsh scenarios. This pump is available in three sizes from 500 GPH to 1100 GPH. The convenience of an automatic on/off is hard to pass up for many people. If this is a feature you are looking for, this unit is worth a serious look. This Rule 25D has a great pumping capacity and is a quality pump at an excellent value. The Rule 25D pump moves water at a rate of 500 GPH. This centrifugal pump is capable of years of dependability in a variety of conditions. Stainless steel components ensure durability in a highly corrosive environment. Ultra-quiet and vibrationless operation help to keep the pump from rattling mounting screws loose. Best of all, this pump comes with a three-year warranty. This pump contends well with some of the higher dollar setups on the market. At 500 GPH, this pump is suitable for all but the largest of watercraft. A great value for the budget-minded consumer. Another automatic pump design, this unit by Attwood is a reliable unit that can keep your boat clean and dry, even when you are not there. This design does not feature a switch for manual operation or quick checks. The unit is compatible with a normal ¾” hose, as is similar to most other pumps. It is available in three sizes from 500 GPH to 1200 GPH. All feature the same hose size except the largest model. 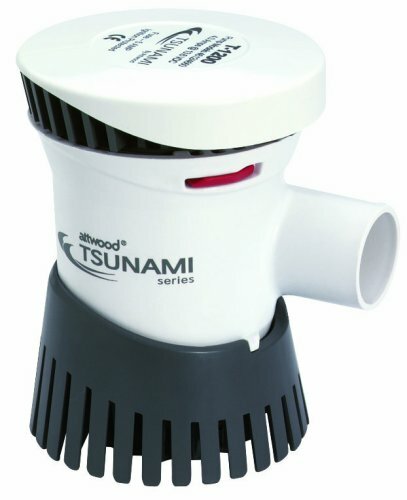 Contained in a compact plastic housing, this unit is suitable for a wide variety of watercraft. Best of all, it comes in at an ultra-low price without big sacrifices in performance or reliability. For the truly budget-minded consumer, this serves as an excellent option. This automatic pump will serve you with years of reliability and is great as a standalone unit or simply one of two units in larger craft. Need a big, heavy-duty pump for your application? 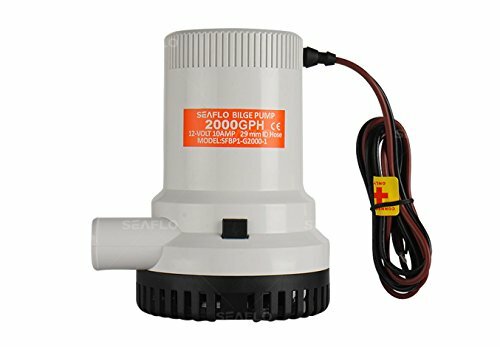 The Seaflo pump moves water at a staggering 2000 GPH and is even rated for saltwater marine applications. This isn’t the unit for your small lake bass boat. This is a unit you will put on a larger boat designed for big water. The fully-submersible design features sealed components where necessary and the heavy-duty motors assist the high output. If you want the safe assurance of a high output pump, look no further. For the high output capacity, this unit by Seaflo still retains a great, low price. This fully submersible unit would do well hardwired into a larger watercraft and could even be paired with a smaller automatic unit. What's the point of a bilge pump if it doesn’t work properly? Part of having a bilge pump is ensuring it is always in proper working order before putting your boat on the water. Bilge pumps are susceptible to damage and clogging from debris, oil, and highly corrosive environments. Regular maintenance and inspection will help ensure you won't get caught taking on water. The video below describes some routine maintenance on bilge pumps and their housing. You should regularly inspect the housing in which your bilge pump sits and be sure it is free from debris. Remove any loose debris and, as shown in the video, consider scraping and removing any gunk from time to time. Next, you should remove the bilge pump screen and clean it out to help maximize flow. This is all the regular cleaning that needs to be done. Also be sure to monitor and waterproof any electrical connections. Wire corrosion is an easy way to prevent an otherwise functioning bilge pump from turning on. Remove dirt, debris, and gunk from bilge pump housing. Clean the intake screen on the bilge pump. Monitor conditions of electrical connections. Disassemble and clean diaphragm pumps to prevent clogging. Knowing a little about bilge pump is important whether you have a bilge pump or not, or have a brand new one or old beat up one. Any modern boat that you’ve invested money into that you wouldn’t want to see sink to the bottom of a lake should have a pump. In addition to being a great convenience that keeps the bottom of the boat free from puddles, they also serve as a cheap insurance mechanism to help prevent boats from sinking. Bilge pumps, while certainly not the most glamorous component of your boat, are an equally important piece of equipment to all your fancy electronics. Don’t get lulled into a false sense of security and ignore your bilge pump. Pay attention to its condition and consider upgrading if it is an old pump. Modern-day centrifugal bilge pumps are highly-affordable and give you no excuse not to have a proper pump on your boat.